The best way to define Qualitative Data is by contrasting the term with Quantitative Data. Research performed by any entity and for any purpose can be classified into two categories: qualitative or quantitative. Quantitative Data is an exact measure, amount, or number related to the question being addressed in the research. If the data can be counted or compared numerically, it is considered quantitative. Because this research is mathematical, it is statistically valid, and you can use your findings to make projections. Qualitative Data describes characteristics or qualities that are non-numerical. They are also considered opinions as they will be very personal to one individual. It focuses on how people feel, what they think, and why they make certain choices regarding products or services. For example, if a restaurant performs research, a quantitative question could be how many times a customer visits the restaurant. The answer would be a specific number. A qualitative question could be what a customer likes from the menu and why. Normally quantitative questions will begin with “how much”, “how many” whereas qualitative questions will start with “how” or “why”. See chart below that compares in detail Qualitative vs. Quantitative Data. Qualitative Data analysis presents a challenge because it is hard to compare different responses. You might not easily have an apples to apples comparison between the different people responding to your survey. The answers might be paragraphs of opinions that you must go through during your research. A researcher must then categorize the data into common themes to quantify different responses into different buckets by association. 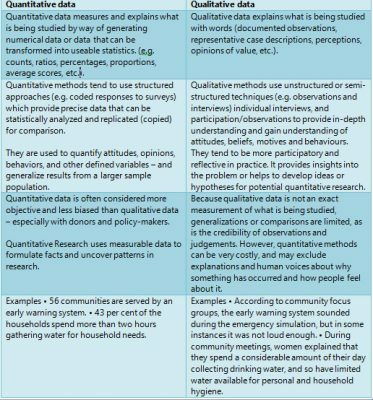 As a researcher, it is important to understand this difference and decide what type of data will you be gathering and if you are using both quantitative and qualitative, how will you integrate these together in your research. For example, if you are doing a research for coffee shops in Los Angeles, Quantitative Data would answer the question how many customers visit the different coffee shops in town. But in order to understand why some locations are more popular than others you will need Qualitative Data on why those customers are visiting those specific coffee shops. The purpose of Qualitative Research is to understand why customers behave a certain way or to make predictions on how customers will react to a product you are planning to launch perhaps. This type of research is costly and because of the expenses, it is often performed on smaller number of people in comparison to Quantitative Data. For this reason, the findings might not be statistically valid, and the researcher needs to understand this before making any decisions with this data. There are many different methods to collect either of these data points. For Quantitative Data it is very common to do surveys online, via phone, or even mail whereas Qualitative Data might require focus groups or interviews to enable getting the granularity of detail needed to understand the customer’s opinion and make valuable conclusions out of it. The resources needed to perform this second type of research are extensive, but it can be extremely valuable if performed correctly. A focus group is a group discussion with a panel of individuals selected based on different criteria. The focus group discussion is led by a moderator. The recommendation for group size is between 5 and 8 participants. It is important to select a moderator that is able to remain impartial through the discussion. This way you guarantee to get honest answers from the participants. It is also important that the moderator has an agenda and plan of action with pre-defined topics and outcomes of the panel. Direct one-on-one interviews are often done either by telephone or face-to-face. This method allows for a more personal approach. It allows the participant to talk more openly and honestly about their own opinion without the risk of these opinions being impacted by other participants like in the case of a focus group. This method is especially preferred over the focus group method when you have a topic of sensitive nature. Overall the value of one-on-one interviews, although more time consuming than focus groups, is that you are able to engage with the participant without any influence from others. As in the focus group, the moderator, in this case called interviewer, should also remain impartial and have a pre-define scope of the interview to guarantee a successful and complete interview. Referring to the coffee shop research above, examples of qualitative questions could be: What do you like most about your favorite coffee shop? Another one could be: How could a coffee shop improve your experience. In these questions you will get an understanding of the criteria the customers have when deciding which coffee shop their favorite is. It could be service, it could be the quality of the coffee, it could be the atmosphere or ambiance of the stores, or even the proximity to their house or office. For startups, it is crucial to do primary research with Qualitative Data collection. If a company wants to launch a new concept of fitness center, they will need to conduct interviews with groups of potential customers, competition, and suppliers. They want to ask potential customers things like: what makes them decide for one fitness center over another, or what type of classes or equipment they need at a fitness center. They might want to understand what facilities the potential customers are using and what would be required for them to switch to a new fitness center. For the competitors, you might want to observe what their competitive advantage is. You might need to understand what makes them unique and why are their current customers picking them as their favorite fitness center. It is very important to plan for a balance of Quantitative and Qualitative Data for your research and to ensure the data points can be combined to reach conclusions. It’s been said that both qualitative and quantitative methods have portions that are subjective or biased and other portions that are objective or unbiased. Due to this conflict, mixing qualitative and quantitative methods is recommended to fully leverage the benefits of both data sets. Combining the sets of data will improve your research by ensuring that the limitations that qualitative research have are being balanced with the strength of quantitative research, and vice versa. Just ensure there is a plan in place to combine these types of research. Some of the specific value add reasons to balance these two research styles is to enrich your data. There are different variables that might only be acquired in either quantitative or qualitative questions. It also allows you to examine your data as you can generate hypotheses from qualitative research and test it in quantitative approach. Balancing Qualitative and Quantitative Data also allows for explaining unanticipated results from the Quantitative Data. You can triangulate, confirm, reinforce, or reject by verifying results from your quantitative section using qualitative questions later or vice versa. Enjoy the beauty of complementing these types of research and study away! 1. Which of the questions below is an example of a Qualitative Question? A. How many times per month do you visit this store? B. Why do you prefer this store over the competitors? C. What is your budget for purchases at this store? D. How many items do you purchase per trip at this store? 2. 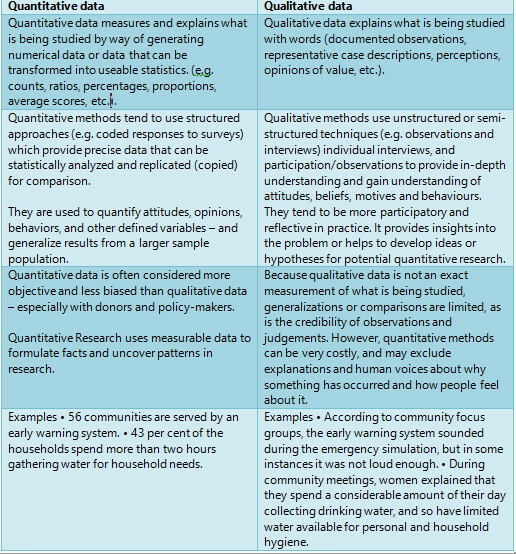 What are some of the advantages of combining Qualitative Data with Quantitative Data in a research?